Top tilapia fillets with a Mediterranean-inspired salsa made with olives, shallots, roasted red peppers and parsley and bake in foil packets. 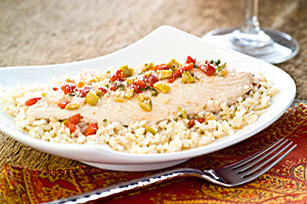 These Fish Fillets with Mediterranean Salsa are easy to prepare and clean-up is a snap! Place 1 fish fillet on centre of each 4 large sheets heavy-duty foil; top with olive mixture. Bring up foil sides. Double fold top and ends to seal each packet, leaving room for heat circulation inside. Place in 17x11-1/2x3/4-inch pan. Bake 15 min. or until fish flakes easily with fork. Cut silts in foil to release steam before opening each packet; top with cheese. Serve with rice. Prepare using any flaky white fish fillets, such as haddock, halibut or cod. Looking to add more fish to your diet? This flavourful dish is sure to win over you and your family.